The Small Function Room will cater for small parties and meetings with a maximum of 100 people maximum and is available 7 days a week. It is ideal for a family get together and meetings. There is a covered outside area which is illuminated and can be heated if required. The Main Hall is the club’s larger function room and will hold 300 people maximum, and is ideal for large parties and weddings. This room is available week nights for private events. However, it is only available on Saturday evenings following consideration by the committee. If given enough notice, the committee will consider hiring the hall out for weddings etc, where a high number of guests can be achieved. This is because the club provides free entertainment for the members most Saturday nights. 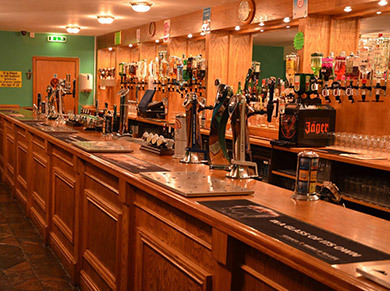 The Lounge Bar is ideal for smaller quiet events such as Wakes; it is cosy and can seat up to 150 people maximum. For more information, including terms and conditions of use and prices; contact the secretary on 02392 472624. The General Room is our busiest bar with darts boards, pool tables and sport on TV screens around the room, entertainment one Sunday afternoon and one Friday evening per month. Mrs Alison Jones, The Kitchen Manager, will provide food for your private function at very competitive prices, be it a cold buffet, curry or a hot plated meal. Ali can be contacted on 07817027893. The club’s kitchen is open for hot food from Thursday evening through to Sunday evening.